This beautifully decorated home is a short walk to downtown Breckenridge and has a view of the entire ski area. It was renovated in 2007 with new paint (warm, inviting colors), granite countertops, stainless steel appliances, carpeting, hardwood floors, furniture (living room and master bedroom), and hot tub. Then it was renovated AGAIN in 2012 with new kitchen/bathroom cabinets, fireplace, interior doors and light fixtures. This 1,672 square-foot house has three bedrooms with three full baths on three different levels. This home features a gas fireplace, gas grill, one-car attached garage, 3 flat panel TV's, 2 DVD players, high speed wireless internet, stereo, washer/dryer, and fully-equipped kitchen. This home is strictly non-smoking, and no pets are allowed. POT SMOKING IS NOT ALLOWED IN THE HOUSE OR ON THE PROPERTY. 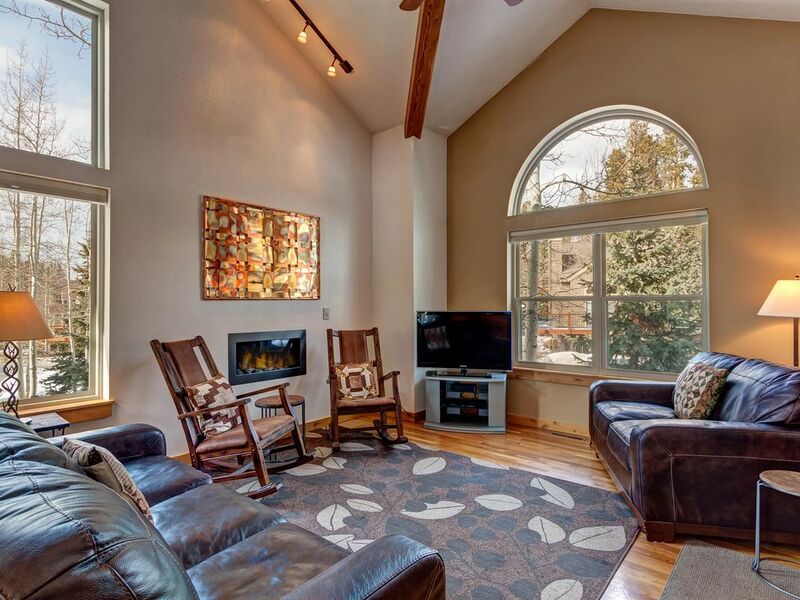 From this home it's a short walk to the downtown Breckenridge shops, restaurants, ice rink, and sledding hill. Catch the Breckenridge Free Ride shuttle just three houses (65 yards) down the street. The shuttle goes to the Peak 9 (Beaver Run) area or the the bottom of the Breck Connect Gondola, which goes to Peaks 7 and 8, depending on which side of the street you get on and on where you want to start your day. Looking to be a little more adventurous? Ride the shuttle to Breckenridge Station and switch buses to head toward Copper Mountain, Keystone, and more! We offer discounts on weekly stays. Enter dates to see discounted totals! Be sure to ask about our special pricing on stays of 7 nights or more! All stays at this property shall include a cleaning fee, sales tax, and a $29 Vacation Rental Damage Protection fee. These will be included in the total on the checkout page. Breckenridge Business License No. 46546. Stay Summit is Summit County's premier lodging and management firm. We offer only the cleanest, best-maintained properties in Summit County, Colorado. From small to large, modest to luxurious, we have a home for anyone and everyone who wants to visit Breckenridge or Frisco. Stay Summit is your one-stop-shop for a flawless vacation! We first vacationed in Breckenridge in 1973 and loved it. The setting is so beautiful and there is so much to do there in both the winter and the summer. And, it takes less than two hours drive to get there from our house. We can't think of a better weekend getaway for us and our family. We purchased the house new in 1994 and remodeled it in 2011 (exterior) and 2012 (interior). We have been renting it on VRBO since 1998. We get a lot of repeat business and have become friends with some of our repeat customers. Of course in the winter we ski, ice skate, and go sledding on a nearby hill. In the summer we play tennis, hike, fish and bicycle. There are bike paths from Breckenridge to Keystone (15 miles), Copper Mountain (20 miles), and Vail (35 miles). Off Street covered garage for 1 car and additional off street parking for 2 cars. Cars must not stick out into the driveway. I stayed here with 5 friends and it was perfect. It's a 10min walk to the lifts or you can grab a shuttle that's located a couple houses down the street. Our group found it easier to just walk because we didn't have to plan our trip to the slopes around the shuttle times. We also found it convenient to walk to the restaurants at night. The house was clean, the kitchen has everything you need to make meals, there is a closet full of board games and there's a stereo w/ aux cord. The hot tub controls didn't work for us but it was hot and that's all we cared about. I would definitely recommend staying here! We really enjoyed our stay here. There were 5 of us and we had plenty of room. The place was clean , nice furnishings and had everything we needed. The hot tub on the deck was a nice addition. We loved that the hot tub is already hot and ready to use. This was great after a long day of skiing. Main street was close enough to walk to. The bus was also easy to catch as well. The unit has a garage we could park our rental car in as well. We would stay here again for sure. Amazing house within walking distance to town! We stayed at this house for one week and it was amazing! It was perfect for my husband and I, our parents, and our teenage son. There is literally nothing negative to say. The neighborhood is super quiet. It’s walking distance to town. It was impeccably clean and well furnished. The kitchen was very well stocked with dishes, pots, utensils, etc. Great view of the ski slopes from the deck and balcony. We used the hot tub on the deck every day. We appreciated the split floor plan that had a bedroom on each level to give us some privacy. Our grr aged loved having his “man cave” downstairs with his own bedroom, living room (with cable TV) and bathroom. Everything was functional. My mom kept saying she would love to buy it, it was that nice. Highly recommend! Over-all stay was excellent. Clean and functional. Great location - easy access both bus and walking distance to ski area and all local attractions. I would stay here again.